Patented manual applicator for applying CPS chemicals to the screen. This novel system is able to pump chemicals from a 25 Litre bulk container directly onto the mesh via a CPS Brush. The CPS Brush Pump works on a syphoning principle and requires no external power, is maintenance free and fully resistant to CPS chemicals. 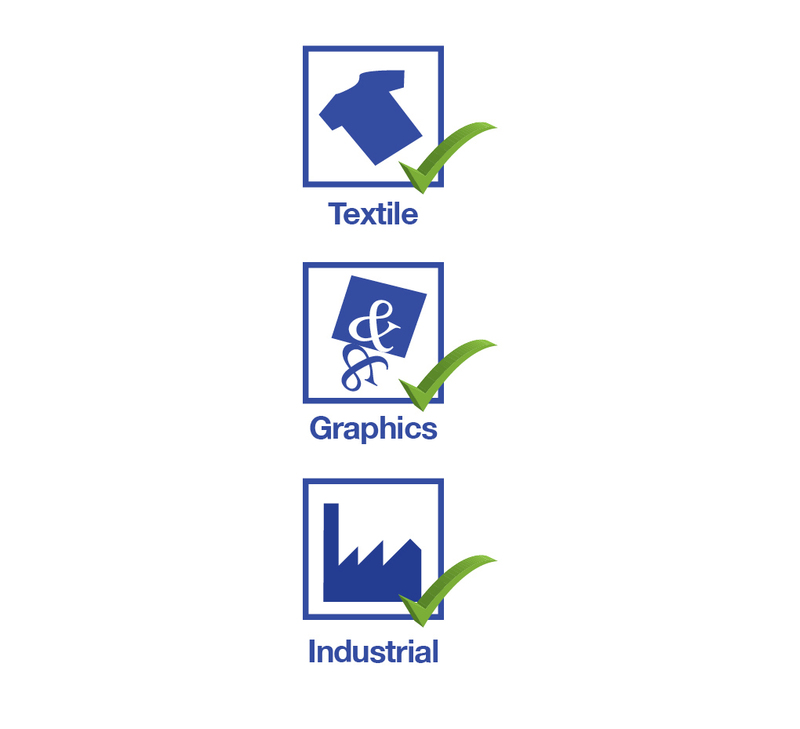 Suitable for CPS Degreasers, CPS Screen Washes, CPS Stencil Removers and CPS Haze Removers. Patented manual applicator for applying CPS chemicals to the screen. 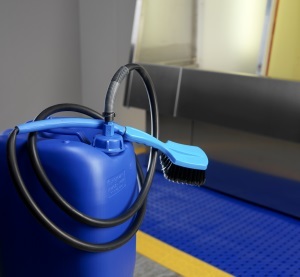 This novel system is able to pump chemicals from a 25 Litre container directly onto the mesh via a CPS Brush. The CPS Brush Pump works on a siphoning principle and requires no external power, is maintenance free and fully resistant to CPS chemicals. Suitable for CPS Degreasers, CPS Screen Washes, CPS Stencil Removers and CPS Haze Removers. Once the CPS Brush Pump has been 'primed' the product is pumped and applied through the brush by the up and down movement during cleaning. 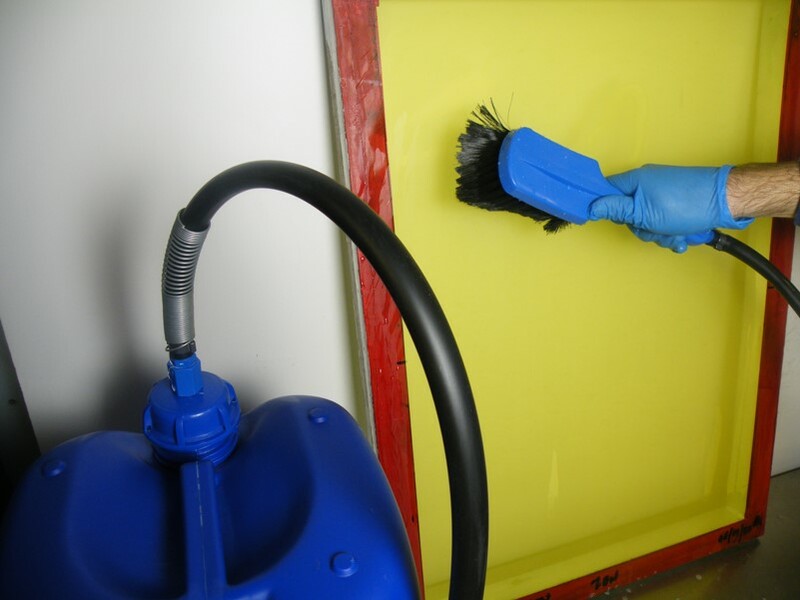 A side to side movement does not cause the product to be pumped through the brush, so this enables the operator to accurately control the amount of product applied to the mesh. * Patented manual applicator for applying CPS chemicals to the screen. * This novel system pumps chemicals from a 25 Litre bulk container directly onto the mesh via a CPS Brush. * Fully resistant to CPS chemicals. * Suitable for CPS Degreasers, CPS Screen Washes, CPS Stencil Removers and CPS Haze Removers. The CPS Brush Pump is ideal for busy print shops where large numbers of screens are processed manualy and CPS chemicals are purchased in bulk. Available in Blue for Ink Cleaners, Yellow for Degreasers and White for Stencil Removers.